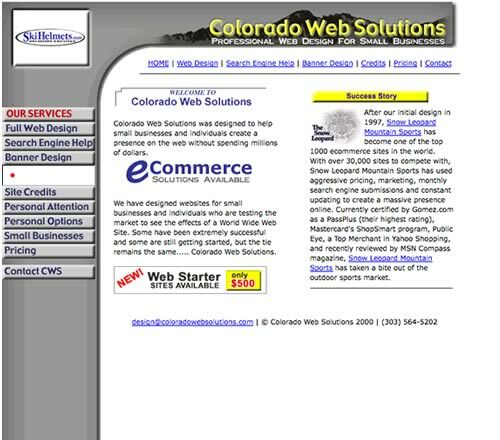 Colorado Web Solutions, LLC. was founded by Matt Sampson. 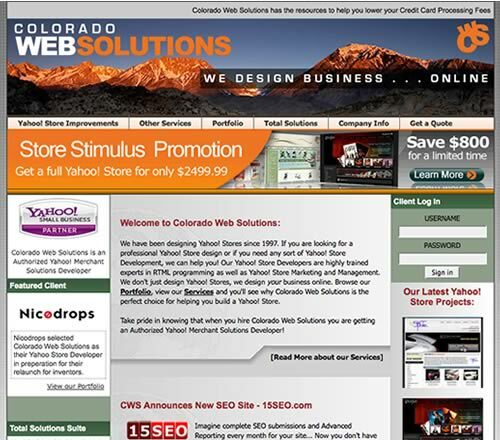 Colorado Web Solutions has been working with online businesses since 1997 and has been an integral partner in the development of hundreds of successful ecommerce sites. CWS has a dynamic core staff with experience in business, manufacturing, distribution, development and (of course) online design, that manages dozens of designers and developers on a daily basis. 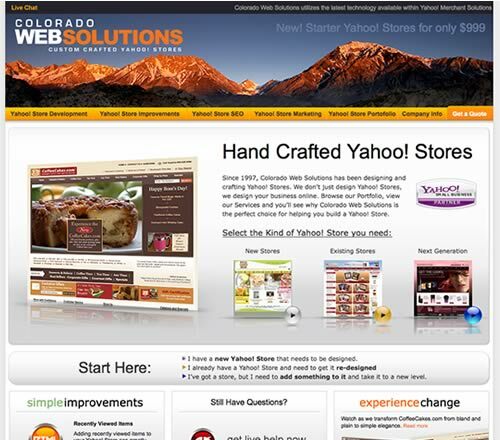 Colorado Web Solutions has established itself as a powerhouse in the Yahoo! Store design community and continues to grow and evolve on a yearly basis. 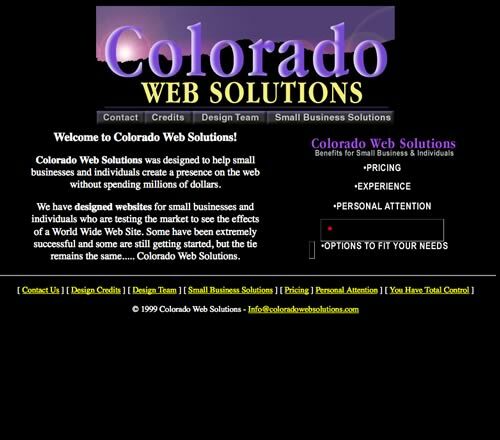 If you are searching for a firm that has a decade of experience and has grown beyond the "mom and pop web design services", Colorado Web Solutions may be your perfect selection. Our staff is based all over the world, we're a truly global company. 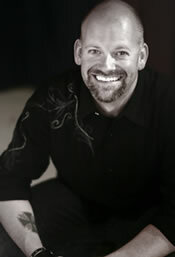 Matt Sampson founded Colorado Web Solutions in 1997. With roots in small business retail all the way back to the age of 13, and immersive ecommerce experience since 1996, Matt Sampson know's first hand the struggles and benefits of small business. Creating his first website in 1997 with an HTML for Dummies book, Matt has been addicted to creating websites, pushing the limits of design and becoming well known for his clean and simple designs. Matt has also become involved in the education of new talent and regularly contributes to the curriculum at college campus around the nation. 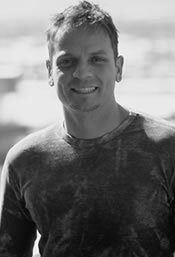 Educated at Colorado College with a degree in Performing Arts and a minor in Film, Matt has always been drawn to creating a feeling and mood through pictures, graphics, sound and light. "Web Design is the same way for me, you get to tell a story without actually being able to explain anything or show anyone around. Your work has to speak to your audience the way you intended." 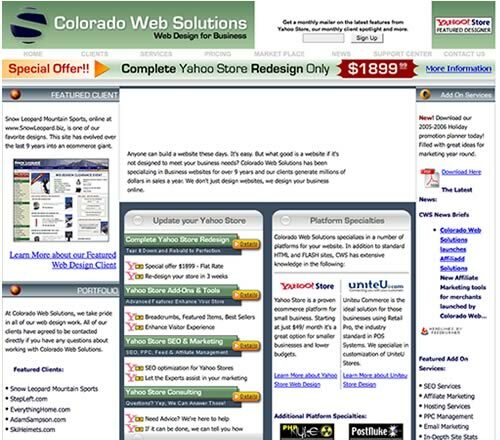 "I take great pride in Colorado Web Solutions. We've grown substantially since this all started more than a decade ago, but we've never lost that personal and dedicated attention to each project that our roots were founded on and that I demand. In my opinion, that is the most important piece of our business... the way we treat our clients." Brent has been working with Yahoo! Stores since 2002. First he worked for an online retailer that used the Yahoo! Store platform and then he came to Colorado Web Solutions in 2005 to lead up our Project Management Team. Brent and his team are the primary reason Colorado Web Solutions has such strong customer satisfaction ratings. "I believe the key to any successful project is open and direct communication with a client. It's my job to not only guide a project from start to finish but more importantly to be the bridge between a clients goals and our development team. This requires the ability to listen to clients, communicate effectively with a variety of personality types and facilitate an effective design process"
Coming from a background of online retail and prior to that providing customer and dealer support for a few major suppliers to the outdoor / ski industry, Brent understands the importance of communicating and taking exceptional care of clients and customers. "At its' core, CWS is fundamentally about customer service. Creating a website is a challenging and complex process and the need for 'customer care' is extremely important. Most of us at CWS have a strong background in Customer Service and it's been our desire to not lose that aspect. Business is about relationships - and key to the core values of CWS is maintaining open dialogues with clients. I believe that's why we have a high client retention rate, we put people first." "The most important thing to consider is creating a website that accurately reflects your business culture and clientele. It's very important to understand your expected customer base and to create a site that caters to their expectations." "Equally as important is to have a clear understanding of exactly what is required to run a successful online business. Many clients don't have realistic expectations of what it will take to create and maintain a successful site. Clients need to understand the limitations of their chosen platform, have a clear grasp of their own limitations and know that it's going to take 10x the work they expect to be successful." "Finally, some of the most successful websites are those that cater to a niche. While it would be nice to be the next Amazon.com and offer everything to everyone, the reality is that seldom is a recipe for success. It's important for clients to think carefully about what they'll be selling and why. If they have a genuine interest in their product, chances are they'll end up resonating that enthusiasm in their site." 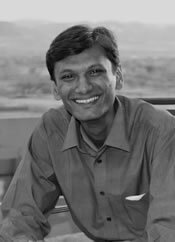 Be Patient... we are still working on Jigar's bio. Stay Tuned. Karen McMasters has owned 3 Yahoo! ecommerce stores since founding BareBabies.com in 2000. With extensive knowledge within the back end of the Yahoo! Store she brings years of background experience from the view of the client to Colorado Web Solutions. She understands the importance of site design for the consumer, balanced with ease of use for the business owner. 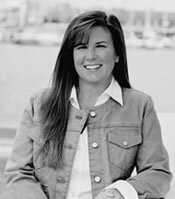 With articles written about her in Entrepreneur Magazine and USA Today as well as book and cable television interviews she has been acknowledged worldwide for her expertise in the ecommerce industry. In her free time she enjoys her husband and 12 year old daughter. Growing up as a competitive gymnast she still enjoys staying fit and healthy, working out indoors and outdoors at the beach near her California home. Our worldwide team is staffed with the top experts in Yahoo! store RTML programming.